Muni has no qualms about the “tax and spend liberal” label: after all, the deficit-burdened transit agency would love to have money to spend. But in order to spend, one must first tax, and San Francisco Municipal Transportation Agency general manager Nathaniel P. Ford, Sr., said Wednesday he may ask the Board of Supervisors to push one of six tax increases that would help the transit agency balance a long-term budget deficit. –$20 million from a 10 percent increase in the “commercial off-street parking tax” (garages), up from 25 percent. Any one of these would have to wind through the legislative process by August 6 in order to qualify for the November ballot, according to the Department of Elections. It warrants mention that every effort to put a tax increase on the ballot over the last two years has failed, and that revenue measures require a 2/3 super-majority at the polls to become law. Taxes are tough pills to swallow, but long-term budget solutions will surely be the name of the game this budget season, as the city faces some $1.5 billion in looming budget deficits over the next several years. 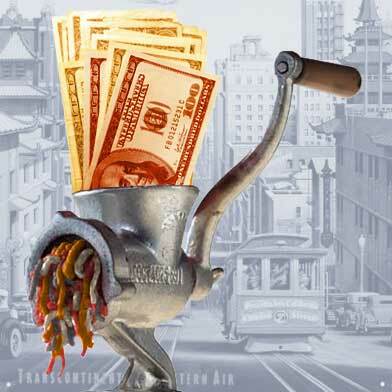 The long-term crunch is why the much-publicized $36 million grant from the state won’t stave off either Muni’s May 8 citywide service cuts or the 280 layoffs throughout Muni’s ranks. The service cuts will save an additional $28.8 million, and trims the next deficit to a mere $26 million.